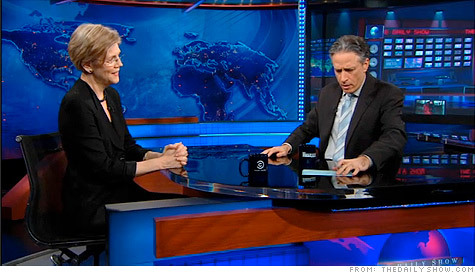 WASHINGTON (CNNMoney) -- Using a familiar, friendly forum, White House adviser Elizabeth Warren went on "The Daily Show with Jon Stewart" to criticize a congressional effort to delay and weaken the consumer bureau created by Wall Street reform. "Now the game is, let's just see if we can stick a knife in the ribs of this consumer agency," she told host Jon Stewart in one of her strongest defenses of the bureau. Warren, a consumer advocate and Harvard University professor working with both the White House and the Treasury Department, explained in the broadcast that aired Tuesday that she is helping put the new bureau together. She said she's also playing a lot of defense to keep the bureau strong and alive. The consumer bureau is a new federal agency that has its own funding and will regulate financial products such as mortgages and credit cards starting July 21. The House Financial Services Committee is considering bills to prevent the bureau from flexing new powers until it has a Senate-confirmed director and to make it easier to overturn and veto new consumer bureau rules. Republicans say the bureau puts too much power in one individual and complain the bureau lacks enough oversight. In defending the agency on the show, Warren harkened back to the plain-spoken, heartfelt attacks that won her such broad public support as a consumer advocate. "Right now there are bills pending in Congress to delay the agency, to defund the agency, to defang the agency, make it toothless, so it won't get anything done," she told Stewart. "And bills to kill the agency outright before it is ever able to take one step on behalf of middle class families." Since Warren went to work for the federal government last year, her public appearances have been more carefully choreographed and less frank. But her appearance on the "Daily Show" showcased the Elizabeth Warren that consumers love, especially with her comparisons of attacks on the bureau to dark alley knife fights. In her talk with Stewart -- who abandons his often critical view of public figures when she appears on the show -- Warren talked about the bureau's purpose, usually in an earnest way. But she got a few laughs. "It wants to make risks clear, it wants to get rid of the fine print -- the 'word barf' in the middle of these financial contracts -- so you can actually make direct comparisons," Warren said. Stewart asked her a lot of questions about why the financial industry and those in Congress are fighting to weaken the consumer agency. "Could you say to Goldman Sachs (GS, Fortune 500), you are no longer in the financial business, you now make hats?" Stewart asked her. "No, I'm afraid all we can do with this consumer agency is really be pretty straight forward. This is about families being able to tell costs and risks," Warren answered. An extended version of the interview appears on the "Daily Show" website.